CarGurus has 3,383 nationwide Panamera listings starting at $20,900. Porsche expands the Panamera lineup for 2014 with the addition of 3 new trims, bringing the total number of Panamera trims to 9. Most attention for 2014 focuses on the new Panamera S E-Hybrid, which replaces the previous year's S Hybrid. Designed to expand the Panamera's ability to operate on electric power alone over greater distances, the S E-Hybrid debuts with a more powerful electric motor and an upgraded lithium-ion battery with greater charge capacity. Porsche also introduces extended-wheelbase Executive trims for the Panamera 4S and Panamera Turbo, which add nearly 5 inches of legroom for second-row passengers. The 3 new trims join the existing Panamera Base, 4, S, 4S, GTS and Turbo. Porsche also unveils a new twin-turbocharged powerplant for 2014 and makes a few cosmetic updates to the Panamera's exterior, which now displays a revised front fascia, restyled bumpers and a revised rear liftgate. Porsche was early to the market in 2010 with its sporty Panamera 4-door sport coupe, leading the way in a new market class of functional yet sporty touring saloons. In recent years, other high-end automakers have jumped into the 4-door coupe segment with vehicles like the BMW 6 Series Gran Coupes, the Mercedes-Benz CLS-Class and the Audi A7. With the introduction of the new S E-Hybrid in particular, Porsche seeks to maintain an edge over its competitors. The electric motor in the S E-Hybrid now produces 95 hp, compared to 47 hp for the previous year. Similarly, battery capacity increases to 9.4 kWh, more than triple the 1.7 kWh capacity of the previous year's battery. The S E-Hybrid can now travel up to 83 mph on electric power alone and cover a distance of more than 20 miles on electric power. The hybrid powerplant also includes a supercharged and intercooled 3-liter V6 engine, which takes over when accelerating, passing or at higher speeds, often boosted by the electric motor, to ensure optimal sport performance. The V6 produces 333 hp and 325 lb-ft of torque, for a combined 416 hp and 435 lb-ft of torque from the hybrid powerplant. The V6 and electric motor both link to an 8-speed Tiptronic S automatic transmission with a manual-shift mode. The S E-Hybrid makes the 0-60 leap in just 5.2 seconds and has a top speed of 167 mph. Although Porsche has not released fuel-economy numbers for the S E-Hybrid, independent sources estimate a top highway number of around 33 mpg. Like all Panamera engines, the hybrid powerplant requires premium fuel. The V6 engine can power an on-board generator that charges the hybrid's battery. However, this can have a negative impact on fuel-economy numbers, which explains why Porsche equips the S E-Hybrid with an external charge port and 2 charging cables for 120- and 240-volt outlets. When connected to a 240-volt power source at home or at a public station, the battery can achieve a full charge in about 2.5 hours. In addition, the hybrid powerplant offers 3 driving modes, including an E-Power mode for operation on the electric motor alone, an E-Charge mode to charge the battery while driving and a Sport mode, which fully engages the V6 engine and adjusts pedal response for sportier performance. A coasting mode at higher speeds also helps to improve fuel economy by turning off the V6 and charging the battery until more power is required. 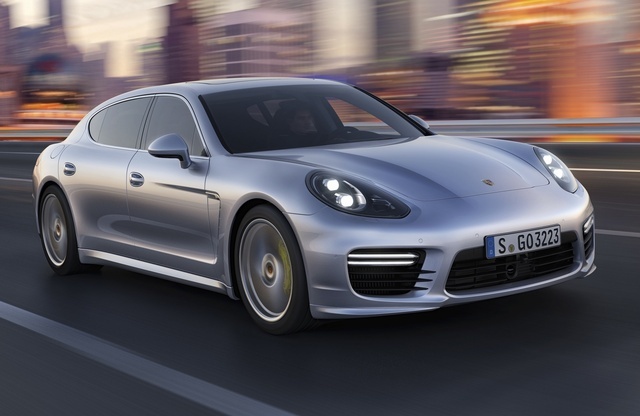 In addition to the updated hybrid powerplant, Porsche unleashes a new twin-turbocharged 3-liter V6 engine for 2014. Replacing the previous year's 4.8-liter V8 engine in the rear-wheel-drive (RWD) Panamera S and Active All-Wheel Drive (AWD) 4S and 4S Executive trims, the new V6 generates 20 more hp and 15 extra lb-ft of torque, despite having 2 fewer cylinders than the V8. Performance numbers jump to 420 hp and 384 lb-ft, and the 0-60 time drops to 4.9 seconds for the S, 4.6 seconds for the 4S and 4.8 seconds for the 4S Executive. An available Sport Chrono Package reduces those numbers even further, to 4.6, 4.3 and 4.5 seconds, respectively. Fuel economy numbers check in at 17 mpg city/27 highway for the S and 4S, and 17/26 for the longer-wheelbase 4S Executive. The Panamera Base and 4 trims continue to receive a 3.6-liter V6 engine, although its output jumps by 10 to 310 hp for 2014, while torque checks in at 295 lb-ft. The base V6 manages fuel-economy numbers of 18/28 in the RWD Base trim and 18/27 in the AWD 4. The top-of-the-line Panamera GTS, Turbo and Turbo Executive all receive different versions of the same 4.8-liter V8 engine. In the GTS, the V8 gets a boost of 10 hp, to 440, while torque remains at 384 lb-ft. The GTS, equipped with Active AWD, gets fuel economy numbers of 16/24. The V8 in the Turbo and Turbo Executive gets twin turbochargers, which pumps up horsepower to 520 for both trims and torque to 516 lb-ft. These trims, also with AWD, manage fuel economy numbers of 15/24. In all Panamera trims except the S E-Hybrid, the engines mate to a 7-speed PDK (Porsche Doppelkupplung) automatic transmission with a manual-shift mode. The standard Panamera rides on a 115-inch wheelbase, while the new long-wheelbase 4S and Turbo Executive trims sit on an extended 120.9-inch wheelbase. Most of the added length comes in the Panamera's rear half, resulting in longer rear doors and an extra 4.7 inches of rear-seat legroom. In addition, the Executive trims receive upgraded rear seats, which now have 6 additional degrees of recline angle, as well as 4-way power lumbar support and 3-stage heating and ventilation. Porsche also includes a unique lighting package with reading lights for both rear seats. The Executive trims also receive automatic soft-close doors and the automaker's Active AWD system. They ride on a rear air suspension system with active damping and unique tuning to optimize comfort for second-row passengers. All Panamera trims continue to come equipped with an aluminum double wishbone independent suspension in the front and an aluminum multi-link setup in the rear. In addition, all trims get variable-ratio power steering except the S E-Hybrid, which receives a Power Steering Plus system, designed for comfort and efficiency. The S E-Hybrid also receives a rear air suspension system with leveling and adjustable ride height. All trims ride on 18-inch wheels except the Executive trims, which upgrade to 19-inch wheels. The 4-door 4-passenger Panamera includes a rear power liftgate, adding to the vehicle's functionality. For 2014, Porsche updates the Panamera's front and rear bumpers and increases the size of the front air intakes, so they meld better with the headlights. The automaker also widens the glass in the rear liftgate and widens the active rear spoiler. Brake caliper colors help distinguish the various trims from each other, with the S E-Hybrid getting Acid Green calipers. The Acid Green color extends to the exterior badging and the needles on the instrument cluster as well. The Panamera Base and 4 get black calipers, while the S and 4S Executive receive silver calipers. The 4S gets yellow calipers and the GTS, Turbo and Turbo Executive display red calipers. In addition, the standard- and long-wheelbase trims display differing rooflines and design cues, which help distinguish the trims from each other. Inside, leather upholstery, 8-way power-adjustable heated front seats, a SportDesign leather-wrapped multifunction steering wheel with paddle shifters, automatic climate control and an auto-dimming rear-view mirror are among the standard features. On standard-wheelbase trims, cargo space in the trunk checks in at 15.7 cubic feet, which expands to 44.6 cubic feet with the rear seats folded down. That drops just slightly, to 15.3 cubic feet and 44.1 cubic feet, for the Turbo Executive. Standard safety features across the line include 10 airbags, Porsche's Stability Management System and a ParkAssist system for the front and rear with an acoustic warning signal. What's your take on the 2014 Porsche Panamera? Users ranked 2014 Porsche Panamera against other cars which they drove/owned. Each ranking was based on 9 categories. Here is the summary of top rankings. 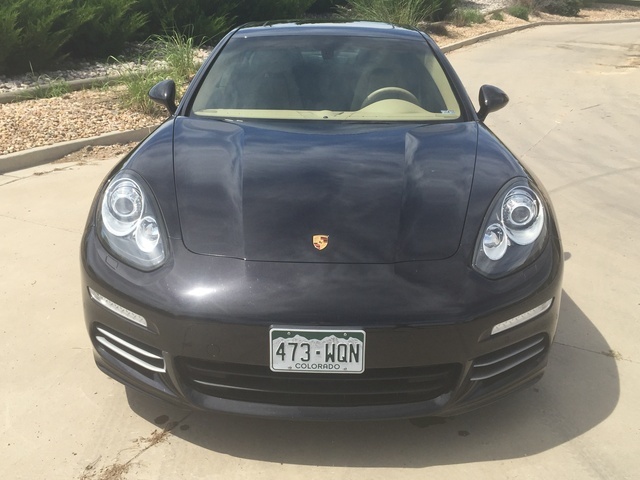 Have you driven a 2014 Porsche Panamera? Why is my listing displayed as a Lemon? I am a new porsche owner and would like to know if PCC needs to be separately equipped and how to identify if my car supports it.